Phosphaturic mesenchymal tumor (PMT), while a rare entity, is nevertheless an important cause of oncogenic malacia/tumor-induced osteomalacia (TIO). This case report highlights the salient clinical and histopathological features of PMT. Our patient was a 47-year-old male who presented with a 5-month history of left groin pain. Plain radiographs of the pelvis and left hip joint revealed an incomplete left subtrochanteric stress fracture. The patient's symptoms were attributed to his left subtrochanteric stress fracture. He was advised to ambulate with crutches and to only partial weight bear on his left lower limb for 2 months. After 2 months of protected weight bearing, the patient's symptoms persisted. A computed tomography (CT) scan of the left hip and femur revealed that the subtrochanteric stress fracture had not healed. Dual-energy X-ray absorptiometry revealed a bone mineral density of the right hip of −1.9 standard deviations, which was indicative of osteopenia. The patient had a low serum phosphate level of 0.41 mmol/L (reference range: 0.85–1.45 mmol/L), adjusted serum calcium of 2.17 mmol/L (reference range: 2.15–2.55 mmol/L), serum parathyroid hormone level of 4.8 pmol/L (reference range: 1.3–9.3 pmol/L), and a low serum 25-hydroxyvitamin D level of 23.3 μg/L (reference range: 30–100 μg/L). The patient had a borderline high fractional excretion of phosphate of 25% (reference range: 5%–25%), low tubular reabsorption of phosphate of 75% (reference range: 80%–95%), and a renal threshold phosphate concentration or ratio of maximum tubular reabsorption of phosphate to glomerular filtration rate (TmPO4/GFR) of 0.35 mmol/L (reference range: 0.8–1.35 mmol/L). The hypophosphatemia persisted in spite of oral phosphate replacement. Further testing revealed a mildly elevated serum level of fibroblast growth factor-23 (FGF-23) of 182 RU/mL (reference range: ≤180 RU/mL). Based on these findings, a diagnosis of osteomalacia was rendered. In view of the persistent hypophosphatemia refractory to oral replacement therapy, accompanying phosphaturia, and mildly elevated FGF-23 level, there was a clinical suspicion of TIO. Positron emission tomography-CT of the whole body was performed to look for a possible neoplasm. This revealed focal uptake of fluorodeoxyglucose at a lytic focus in the right anterior inferior iliac spine (AIIS). A follow-up magnetic resonance imaging of the pelvis showed a well-defined, subcortical lesion with a thin sclerotic border, measuring approximately 1.2 cm × 1.2 cm × 1.2 cm. This lesion was hyperintense on T2-weighted images with moderately avid postcontrast enhancement. No surrounding marrow edema was noted and the cortex overlying this lesion was intact. An excision biopsy of the right AIIS lesion was subsequently performed. One-day postexcision, the serum FGF-23 level had fallen to <50 RU/ml. One-week postexcision, the serum phosphate level had recovered to 0.94 mmol/L. One-month postexcision, the serum phosphate level had further increased to 1.50 mmol/L and the serum 25-hydroxyvitamin D level had recovered to 29.1 μg/L. Six months after surgery, our patient was asymptomatic with no complaints of pain in his left lower limb. X-rays revealed that his left subtrochanteric fracture had healed and new bone had formed across the defect created by the excision of the lesion. The patient's serum phosphate was within normal limits at 1.39 mmol/L and the serum 24-hydroxyvitamin D level was also within normal limits at 28 ug/L. Macroscopically, the tumor was completely intraosseous with intact cortex [Figure 1]. The tumor's histopathological features are demonstrated in [Figure 2]. The tumor was lobulated with slightly irregular borders and displayed a myxoid, glistening cut surface with minute foci of gritty calcifications. Microscopically, the tumor demonstrated a nondestructive pattern of bone invasion featuring neoplastic tissue surrounding bony trabeculae in a “permeating fashion.” The neoplastic spindle cells showed bland nuclear features. Osteoclast-type multinucleated cells were focally present. Mitotic activity was minimal (<1/10 HPFs) and there was no necrosis. The tumor demonstrated highly variable cellularity; in more cellular areas, the tumor cells were spindled in morphology and densely packed together with little intervening collagenous stroma, while in less cellular areas, the tumor cells were stellate to ovoid in morphology, with intervening collagenous stroma, interspersed with areas of prominent myxoid change, imparting a pseudocystic appearance. Within the tumor, there were scattered, dilated, small-to-medium-sized blood vessels, but a typical staghorn or hemangiopericytomatous appearance was not evident. 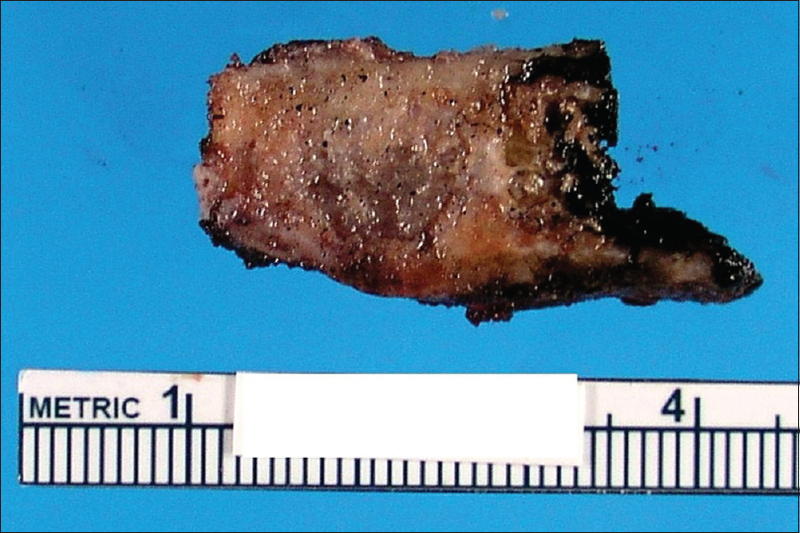 There were several small foci of grungy calcifications within the stroma scattered throughout the tumor. The histopathological features of the tumor were fully consistent with a PMT. Chromogen in situ hybridization showed the tumor cells to be positive for FGF-23. No further immunohistochemistry was performed on the tumor. Complete surgical excision is the treatment of choice, and this leads to the resolution of TIO. Local recurrences following incomplete tumor excision may occur. If a biopsy specimen from a PMT predominantly/only contains areas of bland spindle cells, one would have to contemplate a few differential diagnostic possibilities such as solitary fibrous tumor, myofibroma, and a low-grade fibroblastic osteosarcoma. The presence of grungy calcified matrix in this case is highly characteristic, albeit not pathognomonic of PMT. Further confirmation of the diagnosis of PMT in this case is provided by FGF-23 CISH positivity. Although PMTs display a set of histopathological features (in varying proportions) that are highly characteristic, ancillary tests are helpful and the most useful one is CISH for FGF-23. SSTR2A immunohistochemistry is a new ancillary test that may prove useful in the diagnosis of PMT., A novel FN1-FGFR1 gene rearrangement has also been described in a proportion of PMT, but further studies are needed to better assess the diagnostic relevance of this and also in more detail characterize the genetic signature of this tumor. The authors would like to acknowledge Dr. Andrew Folpe and the Department of Pathology and Laboratory Medicine, University of Rochester Medical Center, for performing the FGF-23 immunohistochemistry and providing us with a representative image. Gardner KH, Shon W, Folpe AL, Wieland CN, Tebben PJ, Baum CL, et al. Tumor-induced osteomalacia resulting from primary cutaneous phosphaturic mesenchymal tumor: A case and review of the medical literature. J Cutan Pathol 2013;40:780-4. Shelekhova KV, Kazakov DV, Michal M. Sinonasal phosphaturic mesenchymal tumor (mixed connective tissue variant): Report of 2 cases. Am J Surg Pathol 2010;34:596-7. Tsujimura T, Sakaguchi K, Aozasa K. Phosphaturic mesenchymal tumor, mixed connective tissue variant (oncogenic osteomalacia). Pathol Int 1996;46:238-41. Harvey JN, Gray C, Belchetz PE. Oncogenous osteomalacia and malignancy. Clin Endocrinol (Oxf) 1992;37:379-82. Peterson NR, Summerlin DJ, Cordes SR. Multiple phosphaturic mesenchymal tumors associated with oncogenic osteomalacia: Case report and review of the literature. Ear Nose Throat J 2010;89:E11-5. Mathis DA, Stehel EJ Jr., Beshay JE, Mickey BE, Folpe AL, Raisanen J, et al. Intracranial phosphaturic mesenchymal tumors: Report of 2 cases. J Neurosurg 2013;118:903-7. 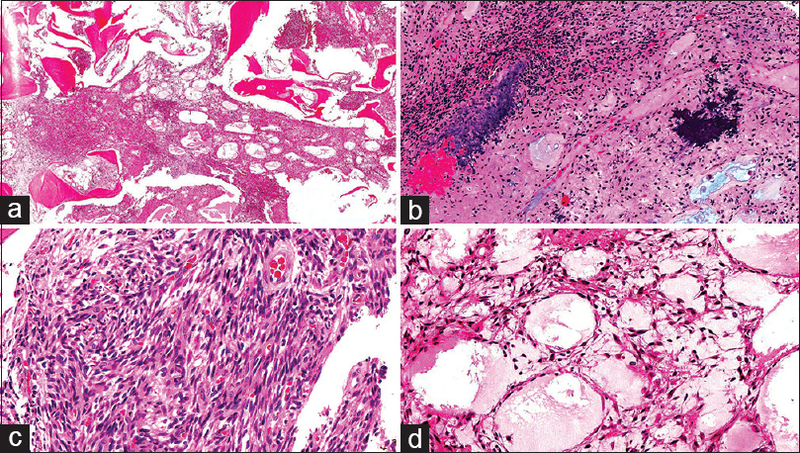 Mok Y, Lee JC, Lum JH, Petersson F. From epistaxis to bone pain-report of two cases illustrating the clinicopathological spectrum of phosphaturic mesenchymal tumour with fibroblast growth factor receptor 1 immunohistochemical and cytogenetic analyses. Histopathology 2016;68:925-30. Clugston E, Gill AC, Graf N, Bonar F, Gill AJ. Use of immunohistochemistry for SSTR2A to support a diagnosis of phosphaturic mesenchymal tumour. Pathology 2015;47:173-5. Houang M, Clarkson A, Sioson L, Elston MS, Clifton-Bligh RJ, Dray M, et al. Phosphaturic mesenchymal tumors show positive staining for somatostatin receptor 2A (SSTR2A). Hum Pathol 2013;44:2711-8. Lee JC, Jeng YM, Su SY, Wu CT, Tsai KS, Lee CH, et al. Identification of a novel FN1-FGFR1 genetic fusion as a frequent event in phosphaturic mesenchymal tumour. J Pathol 2015;235:539-45.